“Education and liberty,” he noted, “walk hand in hand.” Yet it would be 75 years before the college officially accepted black students. The first to officially enter was Beatrix “Betty” McCleary Hamburg ’44, who would later serve as an ambassador for the college, recruiting other black students. Over time, Vassar’s campus community has been a microcosm reflecting the struggles and progress of people of color across the country. Here we list a few milestones toward the broadening of access on campus. 1882 – Princess Oyama (Stematz Yamakawa) ’82 becomes the first Japanese woman to earn a college degree, and becomes a passionate supporter of women’s education. Sterling Allen Brown hired as Vassar’s first black faculty member (part-time). 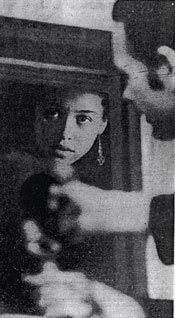 1954 – Henrietta Smith hired as Vassar’s first full-time black faculty member. 1959 – Adolphine Fletcher Terry ’02 founds the Women’s Emergency Committee to support the integrated reopening of schools in Little Rock, Arkansas, after Governor Faubus called in the national guard to maintain a policy of segregation. 1960, March – Approximately 100 Vassar students join a protest at the Poughkeepsie Woolworth. The local demonstration was part of a larger national movement to protest discrimination and lunch counter segregation at Woolworths in the South. 1965 – Six core faculty members establish Vassar’s Asian Studies Program. 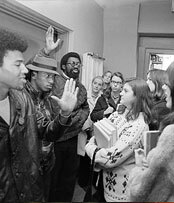 1967 – The Students’ Afro-American Society (SAS) organizes, holding information seminars about Black-oriented issues on campus. 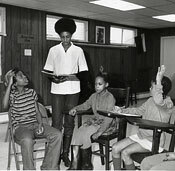 1969 – Kendrick House is established as the Afro-American Cultural Center. 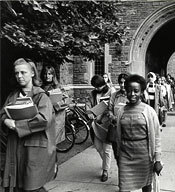 1969 – 34 black female students, led by Claudia Lynn Thomas ’71, take over Main Building for nearly three days, prompting the College’s administration to take further steps addressing the needs of Vassar’s African American community. 1971 – Vassar faculty officially approve the creation of an East Asian Studies major. 1976 – The Intercultural Center is established in the basement of Lathrop House. Late 1980s – The Spanish American Latin Student Association (SALSA) is founded, becoming Poder Latina/o in 1990. 1990s – Vassar commits to establish an expanded and more comprehensive Asia curriculum. 1990 – In response to what some students considered to be racist remarks made by Senator Daniel Patrick Moynihan following an on-campus lecture, students occupied Main for 35 hours in protest, calling for him to resign his Eleanor Roosevelt Professorship, and calling upon the college’s administration to take greater steps to address the needs of the campus’s ethnic, religious and sexual minorities. 1990 – The Asian Students’ Alliance comes into existence as a newly named and updated version of the preexisting Association of Students Interested in Asia (ASIA). 1990 – The Intercultural Center moves from Lathrop to Blegen House on Collegeview Avenue. 1992 – The Korean Students Association is formed, but folds after just three years. 1993 – The Intercultural Center moves into a newly renovated building behind College Center. 1994 – The Caribbean Students Alliance is formed. 1995 – The Southeast Asian Students Alliance is formed. 1998 – The Intercultural Center is renamed the ALANA Center, an acronym that includes various communities of color: African American/Black, Latino/a, Asian/Asian-American, and Native American. 2000s – Vassar’s continuing commitment to Asian Studies, in concert with several major grants, expands the number of participating faculty to 22. 2000 – MEChA de Vassar (Movimiento Estudiantil Chicano de Aztlán) is founded, giving a campus student voice to the Chicano (Mexican American) civil rights movement. 2004 – The Department of Chinese & Japanese is founded at Vassar, focusing not just on language, but also an understanding of literature and culture, integrating arts such as calligraphy, flower arrangement and tea ceremony into the curriculum. Department-sponsored events include a cultural festival, New Year celebration, and cherry blossom festival. 2010 – Vassar’s incoming class of 2014 includes nearly 35% students of color, the largest percentage in the college’s history. Peter Bronski and Cynthea Ballard ’13 were contributors to this story. The college’s progressive agenda of higher education for women has been well-established. It is a hallmark of Matthew Vassar’s great enterprise. And yet, even at the founding of the college, his forward-thinking stance on women’s education was framed within societal expectations of a woman’s place and role. After more than a century of all-female education—as well as a brief flirtation with coeducation thanks to a group of young men admitted to the college under the GI Bill® following World War II—Vassar contemplated a bold change that would chart a new direction for the college: full coeducation.